The Daily (Maybe): Is religion worth worrying about? Is religion worth worrying about? Some people do get in a lather about religion don't they? Just because it's provided the cloak of moral legitimacy to historic swathes of injustices, massacres and brutality throughout the ages it's bee in the bonnet time. They often forget about the jumble sale, social concern and soup kitchens side of things. The atheist bus campaign has been interesting, partly because it's provided gentle relief to those who are rather sick of being lectured with the slogans of organised religion but also because it's tone has been consciously light and playful, probably trying to avoiding looking like a mirror image of preachy dogma. Whilst this is not quite bombastic rationalism (with it's over modest 'probably') the campaign still received the support of Richard Dawkins, the Ayatollah of atheism himself. Having set their sights at just over five thousand pounds they unexpectedly raised over £110,000 from a whole series of small, online donations. We can expect to see buses all over the country with a series of anti-God demands in the coming months. 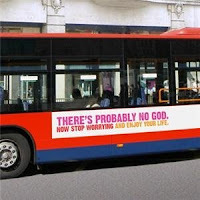 "While I welcome the upfront self-confidence of the atheist bus campaign (Arriving soon, October 22), I do have reservations about the suggestion that those of us who don't believe in God have nothing to worry about, with climate change and an economy in meltdown. Central to my atheism is the knowledge that we don't get any second chances in an afterlife and we have no superior being to guide us out of the mess we are making. Yes, let's enjoy life and not live in guilt and fear, but let us also take full responsibility for our actions." I was personally thinking of raising money for a bus that simply shrieked "WE'RE ALL DYING! WAKE UP!" in huge dripping letters, you know, just to shake people a bit. I've thought better of it since though, because there may be something in this light touch thing. I know the House Martins thought describing people as sheep was useful but I suspect that sort of thing can be counter-productive. Over all I'm for the campaign because it's caused a little bit of a stir and made secularists a bit more confident, but I am slightly puzzled about what it's supposed to achieve. I'm assuming the organisers don't think there will be many 'road to Dagenham' moments with people rejecting their faith on the number 42. Dawkins wants to make people think. I suspect it has succeeded in generating some debate, and a few nice comedy moments like this one from Have I got news for you. So that modest aim has been met, and I don't think they've gone up on any buses yet. The campaign even has support from those who would not describe themselves as atheists like Sunny Hundal who says "the speed at which donations have been raised shows that when Britons get excited about specific political issues they’re as likely as Americans to donate money online. Surely its only a matter of time before organisations here try and exploit that?" Sadie however considers the whole thing less than satisfactory. Or in her words "smug, liberal, metropolitan, self-satisfied bull emanating from the usual penne-munching, ethically-sourced cocaine snorting, north London mafia that we've been subjected to in recent years this, people, THIS really takes the biscuit." I think she's wrong to be quite so incensed about this, but there is a small part of me that thinks there may be a smidgen of a point in there. If you just tell people you're cleverer than them and something they fundamentally believe to be true is just silly and further proof of their idiocy it can rather resemble smug, can't it? The 'is there a God' debates seem slightly sterile to me, even if I have taken part in them occasionally. I think those of us on the left really need to be concentrating on what unites us, rather than focusing on why we think we're better than everyone else. If we want to combat sexism, homophobia or intolerance let's, but let's not pretend that all religious people share those values and that roundly denouncing religion helps those causes. I'll always remember organising an event with some Christians who, when I mentioned the left, said they wanted to keep distanced from it because "the left hate Christians". It was pretty difficult to disagree with and extraordinarily frustrating. Rightwing religious organisations and campaigns *are* a problem but it's the reactionary part that's the problem - not the spirituality. There are plenty of churches that can be a vehicle for mobilising progressive social change and we need to welcome them as part of the mix. It's not necessarily going to be expressed in a way we're used to or come without specific problems - but I'd like to see which left organisation doesn't come with difficult baggage or idiosyncracities that would have to be dealt with too. Anyway, the scale of support for the campaign has been really interesting to witness as well as the tactical nouce to keep it fluffy. I guess it shows what can be achieved when you really don't believe in something. Jim, you're on fire - this and the subsequent piece on the American elections are just tip-top blogging. I nominate you for another imaginary award (I'll get round to making a specific one up if you like). There is a valid point that this is a sort of liberal smugness, but it's nothing on the smugness of the fundies that think that atheists haven't seen the light... I would be less inclined to agree with it if it wasn't a direct response to religious preachery in bus ads. Well I think you're right Modernity and Green Gordon (and James :)) it is important to see this in context - which is why I wanted to mention Sadie but not take her side as such. One thing I haven't blogged about but has looked interesting is Phil Woolas' *other* controversial statement which was in favour of the disestablishment of the church of england... something that is well over due. Yes, let's respect the personal beliefs of others and I'm not against that taking some institutional form - but for the State to be tied to one particualr form of Christianity denegrates the citizens, the state and, as it happens, the church. doesn't respect cut both ways? Sure it cuts both ways - but I think you've been pretty unlucky if you've never heard a religious person be respectful of others. sure enough, you'll hear one or two individuals being pleasant, but the test of people is when they have power and can act as a group, what do they do? flex their muscle or act humane? and that's where you won't find any realtolerance for non-God believing people, the problem is that a chunk of theists seem to think that belief in a deity somehow privileges their views over others and it is so so wrong. You're quite right MB, you did. My mistake. I still think you're going a bit far though as there are very different strands - parts of the CoE for instance are extremely secular. it is not whether or not they have nice manners and say "let's live and let live"
"secular enough to argue for the complete disestablishment? I doubt it"
Yes. Most Christians are in churches unaffiliated to the state and I suspect if we polled of coe people a good number would be in favour of seperation of church and state. "secular enough to forgo government funding for religious schools? I doubt it"
Well... yes. In the sense that many Christians do not want to send their children to explicitly religious schools and many religious schools are private. I'm not quite sure what power and influence the archbishop of cantebury has these days but I don't think he's quite the malign force you seem to be making him out to be. There was reaction against and support for the bus advert - but there weren't riots or anything. Let's get this in perspective. "parts of the CoE for instance are extremely secular." now you are broadening the point to include other Christians, hmm. I know of no organized group in the CoE which advocates complete disestablishment? if there is one, please let us know. I think you are missing my other point, the REACTION to the bus advert was POSITIVE, 20 times what was expected, thus, it is fair to ask WHY that was so? my own view is that people are getting cheesed off with the religious intrusion into secular life. either way, there has to be SOME reason? what caused that type of reaction? what other explanations could there be?